Last Thursday, I attended the excellent Humanities Data Curation Summit, organized by Allen Renear, Trevor Muñoz, Katherine L. Walter, and Julia Flanders. I'm still processing the day, which included a breakout session with Allen, Elli Mylonas, and Michael Sperberg-McQueen, who are some of my favorite people in DH. What I started thinking about today was that we'd skipped definitions at the beginning—there was a joke that Allen, as a philosopher, could have spent all day on that task. But in doing so, we elided the question of what is data in the humanities, and what is different about it from science or social science data. Humanities data are not usually static, collected data like instrument readings or survey results. They are things like marked up texts, uncorrected OCR, images in need of annotation, etc. Humanities datasets can almost always be improved upon. "Curation" for them is not simply preservation, access, and forward migration. It means enabling interested communities to work with the data and make it better. Community interaction needs to be factored into the data's curation lifecycle. In my last post, I argued that TEI is a text modelling language, and in the prior post, I discussed a frequently-expressed request for TEI editors that hide the tags. Here, I'm going to assert that your editing interface (implicitly) expresses a model too, and because it does, generic, tag-hiding editors are a losing proposition. Everything to do with human-computer interfaces uses models, abstractions, and metaphors. Your computer "desktop" is a metaphor that treats the primary, default interface like the surface of a desk, where you can leave stuff laying around that you want to have close at hand. "Folders" are like physical file folders. Word processors make it look like you're editing a printed page; HTML editors can make it look as though you're directly editing the page as it appears in a browser. These metaphors work by projecting an image that looks like something you (probably) already have a mental model of. The underlying model used by the program or operating system is something else again. Folders don't actually represent any physical containment on the system's local storage, for example. The WYSIWYG text you edit might be a stream of text and formatting instructions, or a Document Object Model (DOM) consisting of Nodes that model HTML elements and text. If you're lucky, there isn't a big mismatch between your mental model and the computer's. But sometimes there is: we've all seen weirdly mis-formatted documents, where instead of using a header style for header text, the writer just made it bold, with a bigger font, and maybe put a couple of newlines after it. Maybe you've done this yourself, when you couldn't figure out the "right" way to do it. This kind of thing only bites you, after all, when you want to do something like change the font for all headers in a document. And how do we cope if there's a mismatch between the human interface and the underlying model? If the interface is much simpler than the model, then you will only be able to create simple instances with it; you won't be able to use the model to its full capabilities. We see this with word processor-to-TEI converters, for example. The word processor can do structural markup, like headers and paragraphs, but it can't so easily do more complex markup. You could, in theory, have a tagless TEI editor capable of expressing the full range of TEI, but it would have to be as complex as the TEI is. You could hide the angle brackets, but you'd have to replace them with something else. Because TEI is a language for producing models of texts, it is probably impossible to build a generic tagless TEI editor. In order for the metaphor to work, there must be a mapping from each TEI structure to a visual feature in the editor. But in TEI, there are always multiple ways of expressing the same information. The one you choose is dictated by your goals, by what you want to model, and by what you'll want the model to do. There's nothing to map to on the TEI side until you've chosen your model. Thus, while it's perfectly possible (and is useful,* and has been done, repeatedly) to come up with a "tagless" interface that works well for a particular model of text, I will assert that developing a generic TEI editor that hides the markup would be hard task. This doesn't mean you couldn't build a tool to generate model-specific TEI editors, or build a highly-customizable tagless editor. But the customization will be a fairly hefty intellectual effort. And there's a potential disadvantage here too: creating such a customization implies that you know exactly how you want your model to work, and at the start of a project, you probably don't. You might find, for example, that for 1% of your texts, your initial assumptions about your text model are completely inadequate, and so it has to be refined to account for them. This sort of thing happens all the time. My advice is to think hard before deciding to "protect" people from the markup. Text modeling is a skill that any scholar of literature could stand to learn. UPDATE: a comment on another site by Joe Wicentowski makes me think I wasn't completely clear above. There's NOTHING wrong with building "padded cell" editors that allow users to make only limited changes to data. But you need to be clear about what you want to accomplish with them before you implement one. I'm teaching a TEI class this weekend, so I've been pondering it a bit. I've come to the conclusion that calling what we do with TEI "text encoding" is misleading. I think what we're really doing is text modeling. TEI provides an XML vocabulary that lets you produce models of texts that can be used for a variety of purposes. 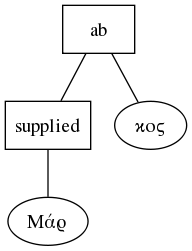 Not a Model of Text, mind you, but models (lowercase) of texts (also lowercase). TEI has made the (interesting, significant) decision to piggyback its semantics on the structure of XML, which is tree-based. So XML structure implies semantics for a lot of TEI. For example, paragraph text appears inside <p> tags; to mark a personal name, I surround the name with a <persname> tag, and so on. This arrangement is extremely convenient for processing purposes: it is trivial to transform the TEI <p> into an HTML <p>*, for example, or the <persname> into an HTML hyperlink, which points to more information about the person. It means, however, that TEI's modeling capabilities are to a large extent XML's own. This approach has opened TEI up to criticism. Buzetti (2002) has argued that its tree structure simply isn't expressive enough to represent the complexities of text, and Schmidt (2010) criticizes TEI for (among other problems) being a bad model of text, because it imposes editorial interpretation on the text itself. The main disagreement I have with Schmidt's argument is the assumption that there is a text independent of the editorial apparatus. Maybe there is sometimes, but I can point at many examples where there is no text, as such, only readings. And a reading is, must be, an interpretive exercise. So I'd argue that TEI is at least honest in that it puts the editorial interventions front and center where they are obvious. As for the argument that TEI's structure is inadequate to model certain aspects of text, I can only agree. But TEI has proved good enough to do a lot of serious scholarly work. That, and the fact that its choice of structure means it can bring powerful XML tools to bear on the problems it confronts, means that TEI represents a "worse is better" solution.† It works a lot of the time, doesn't claim to be perfect, and incrementally improves. Where TEI isn't adequate to model a text in the way you want to use it, then you either shouldn't use it, or should figure out how to extend it. One should bear in mind that any digital representation of a text is ipso facto a model. It's impossible do anything digital without a model (whether you realize it's there or not). Even if you're just transcribing text from a printed page to a text editor you're making editorial decisions, like what character encoding to use, how to represent typographic features in that encoding, how to represent whitespace, and what to do with things you can't easily type (inline figures or symbols without a Unicode representation, for example). So why argue that TEI is a language for modeling texts, rather than a language for "encoding" texts? The simple answer is that this is a better way of explaining what people use TEI for. TEI provides a lot of tags to choose from. No-one uses them all. Some are arguably incompatible with one another. We tag the things in a text that we care about and want to use. In other words, we build models of the source text, models that reflect what we think is going on structurally, semantically, or linguistically in the text, and/or models that we hope to exploit in some way. For example, EpiDoc is designed to produce critical editions of inscribed or handwritten ancient texts. It is concerned with producing an edition (a reading) of the source text that records the editor's observations of and ideas about that text. It does not at this point concern itself with marking personal or geographic names in the text. An EpiDoc document is a particular model of the text that focuses on the editor's reading of that text. As a counterexample, I might want to use TEI to produce a graph of the interactions of characters in Hamlet. If I wanted to do that, I would produce a TEI document that marked people and whom they were addressing when they spoke. This would be a completely different model of the text than a critical edition of Hamlet might be. I could even try to do both at the same time, but that might be a mess—models are easier to deal with when they focus on one thing. This way of understanding TEI makes clear a problem that arises whenever one tries to merge collections of TEI documents: that of compatibility. Just because two documents are marked up in TEI, that does not mean they are interoperable. This is because each document represents the editor's model of that text. Compatibility is certainly achievable if both documents follow the same set of conventions, but we shouldn't expect it any more than we'd expect to be able to merge any two models that follow different ground rules. * with the caveat that the semantics of TEI <p> and HTML <p> are different, and there may be problems. TEI's <p> can contain lists, for example, whereas HTML's cannot. Yes, I wrote a blog post with endnotes and bibliography. Sue me. Buzzetti D. "Digital Representation and the Text Model." New Literary History 2002; 33.1:61-88. Schmidt, D. "The Inadequacy of Embedded Markup for Cultural Heritage Texts." Literary and LInguistic Computing 2010; 25.3:337-356. From time to time, I hear an argument that goes something like this: "Our users won't deal with angle brackets, therefore we can't use TEI, or if we do, it has to be hidden from them." It's an assumption I've encountered again quite recently. Since it's such a common trope, I wonder how true it is. Of course, I can't speak for anyone's user communities other than the ones I serve. And mine are perhaps not the usual run of scholars. But they haven't tended to throw their hands up in horror at the sight of angle brackets. Indeed, some of them have become quite expert at editing documents in TEI. The problems with TEI (and XML in general) are manifold, but its shortcomings often center around its not being expressive *enough* to easily deal with certain classes of problem. And the TEI evolves. You can get involved and change it for the better. The IWNNETAAB objection seems grounded in fear. But fear of what? As I mentioned at the start, IWNNETAAB isn't usually an expression of personal revulsion, it's not just Luddism, it's IWNNETAAB by proxy: my users/clients/stakeholders won't stand for it. Or they'll mess it up. TEI is hard. It has *hundreds* of elements. How can they/why should they learn something so complex just to be able to digitize texts?! What we want to do is simple, can't we have something simple that produces TEI in the end? The problem with simplified editing interfaces is easy to understand: they are simple. Complexities have been removed, and along with them, the ability to express complex things. To put it another way, if you aren't dealing with the tags, you're dealing with something in which a bunch of decisions have already been made for you. My argument in the recent discussion was that in fact, these decisions tend to be extremely project-specific. You can't set it up once and expect it to work again in different circumstances; you (or someone) will have to do it over and over again. So, for a single project, the cost/benefit equation may look like it leans toward the "simpler" option. But taken over many projects, you're looking either at learning a reasonably complex thing or building a long series of tools that each produce a different version of that thing. Seen in this light, I think learning TEI makes a lot of sense. On the learning TEI side, the costs go down over time, on the GUI interface side, they keep going up. Moreover, knowing TEI means that you (or your stakeholders) aren't shackled to an interface that imposes decisions that were made before you ever looked at the text you're encoding, instead, you are actually engaging with the text, in the form in which it will be used. You're seeing behind the curtain. I can't really fathom why that would be a bad thing.